The BRIESE sun enables you to illuminate very large objects. A maximum of 12,800 W’s gives a large-area uniform lighting effect, including hard projection shadows. The angle of illumination can be varied by focusing the light output. Anyone who wants to film summer scenes in the winter, or if a trip to the Caribbean is too expensive, the Briese Sun will help. It makes a consistently hard, sun-like illumination of smaller but also larger scenes possible, with crisp shadows coming from one direction. 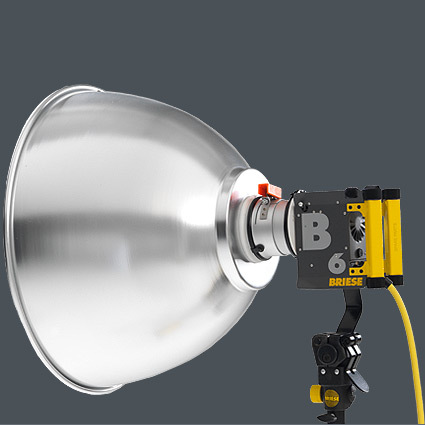 The Briese Sun is compatible with the H2 and H5 (2K and 5K Tungsten) lamp heads, as well as the 1.2K and 2.5K (HMI) T4 lamp heads.